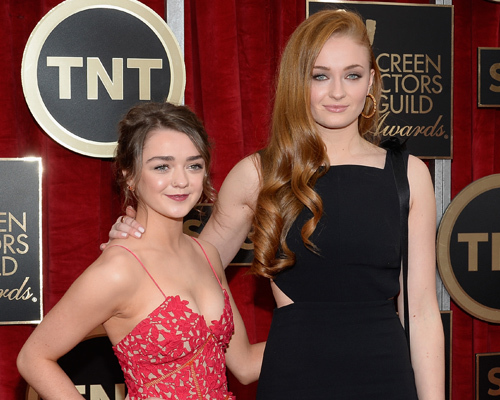 Sophie Turner and Maisie Williams rock matching brownies costumes... with a twist! We might’ve just found the winners of this year’s Halloween costumes! The adorable duo of Sophie Turner and Maisie Williams rocked matching brownies costumes, but their ensembles had an added a twist and it is brilliant. The Game of Thrones co-stars and best friends decided to rock matching Halloween costumes over the weekend as they celebrated the holiday in England. What was their totally unique spin on your traditional Girl Scout Brownies costume you ask? They were pot brownies! Yes, Turner and Williams, whose BFF name is Mophie, donned Girl Scout Brownies costumes, complete with the sash, brown skirt, and a “Brownies” tee, but their patches were weed designs, and we are totally obsessed with their cheeky brownies costumes. "Nortiness ensues," Turner captioned the adorable Halloween costume photo. "everyone loves a hash brownie," Williams captioned the same photo on her Instagram account. Does everyone love a hash brownie? Girl Scout Brownies, yes. Double chocolate chip brownies, yes. But Hash brownies? They might not be everyone’s cup of tea, but a costume version of the weed treats we can definitely get on board with! "Most people bring alcohol to house parties, @sophiet brings lollypops " Williams wrote alongside a closer photo of her Girl Scout inspired costume as she enjoyed a lollipop curtesy of her bestie. The GOT actresses spent all of Halloween weekend together, dubbing it a "Norty weekend" and we are so jealous that we weren't invited. On Saturday the two British actresses spent time with their squad and obviously posed for a group photo before getting dressed up the next day and celebrating Halloween at a house party. Whether “L” is for love or loser, we definitely want in on this #SquadGoals picture.